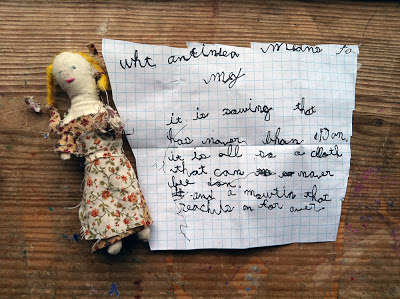 First, there was Amelia the hand-made doll and her essay "What Infinity Means to Me." That was early in 2013. Since then, Miss Amelia has been on all sorts of notable journeys. Most recently she's been the subject of some interesting math questions. For instance, Amelia needed a new dress. 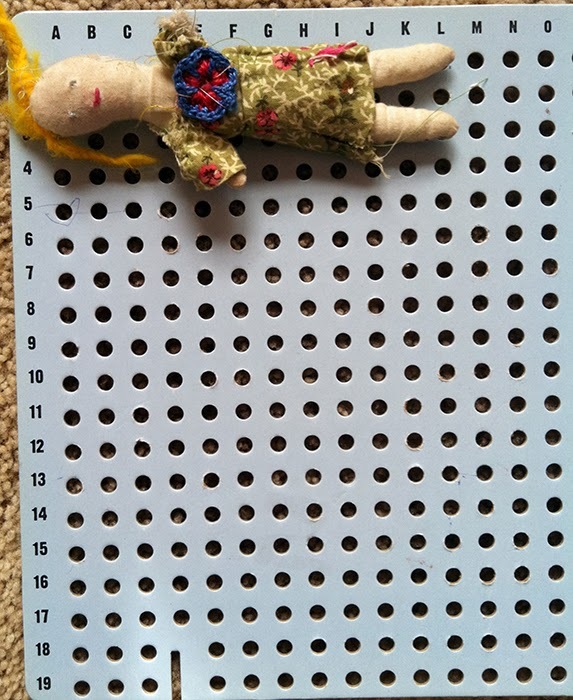 Unable to find the tape measure, my disorganized eight year old devised an interesting new way to measure out a piece of cloth. 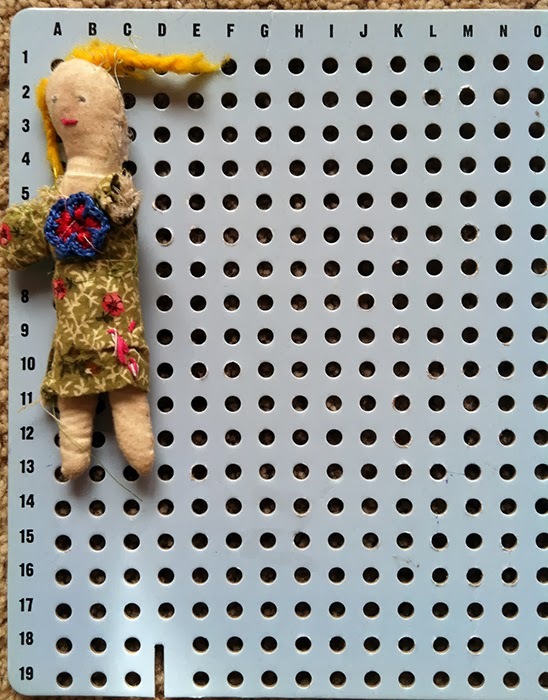 She used this work board from a physics activity (investigating levers, pulleys, etc.). ...and then cut out two identical square pieces of cloth (front and back of new dress) with which to sew the dolly a new garment. 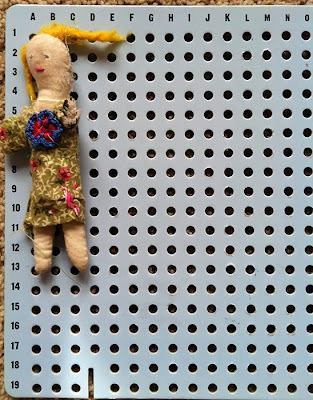 Amelia was also recently the subject of a conversation about doll years. I'm pretty sure I didn't have enough math to truly help her, but here's what came of it. My kid wanted to make sure Amelia was SIX in doll years. 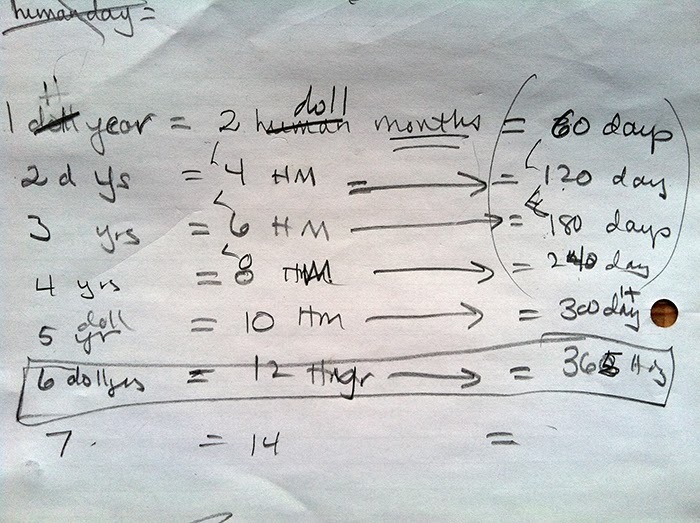 Apparently (after a very heated, frustrating conversation mostly, I assume, because she wasn't really clear about what she was trying to ask) one doll year is equal to two human months. The only way I could help her figure it out was by writing out her ideas for her, one step at a time. 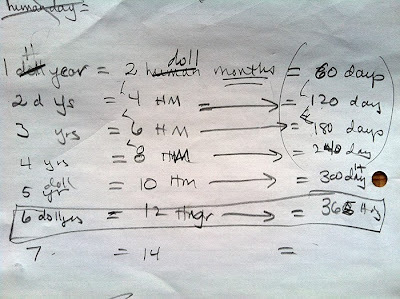 One problem was that my kid was thinking in too many time units at once -- days, months, and years. We did finally come to a conclusion that was agreeable to her. I almost typed 'concussion' because that's how I felt after it was all over. I wonder what kind of math adventures Amelia will have next? "Its math skills are the wonder of the land"
My eight year old gave me a lovely Christmas present. 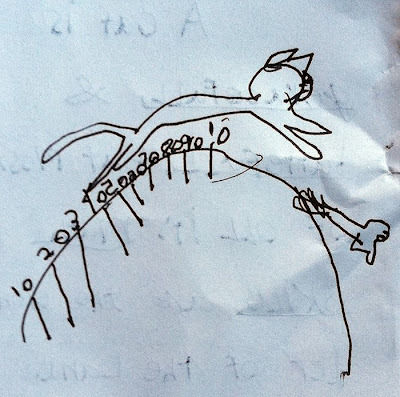 By way of explanation, long-time readers are well aware of her affinity for cats. In addition, we have taken a very inclusive approach to learning math by which I mean that we endeavor to find it in all parts of our daily life. This is why math appears so frequently in her expressive moments and is featured prominently here in the small piece of prose presented to me on Christmas morning. are the wonder of the land. force to run to catch a squirrel! geometry and agility of jumping! So I’m working on a book. While I work on another book. This other book is a project through Moebius Noodles and Maria Droujkova’s publishing company Delta Stream Media. 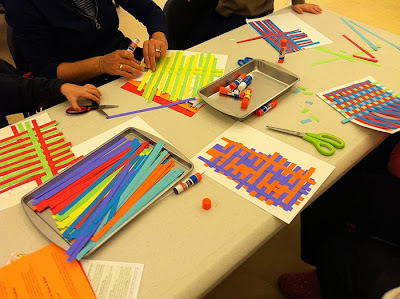 I’m collaborating with Maria and Gordon Hamilton of Math Pickle to create original puzzles, games, and making activities exploring numerical and categorical variables … for young kids! It’s super awesome extremely cool. And, today? Today, our conversations in relation to the variables book helped me clarify something I’ve been thinking about on a LOT of different levels for literally YEARS. 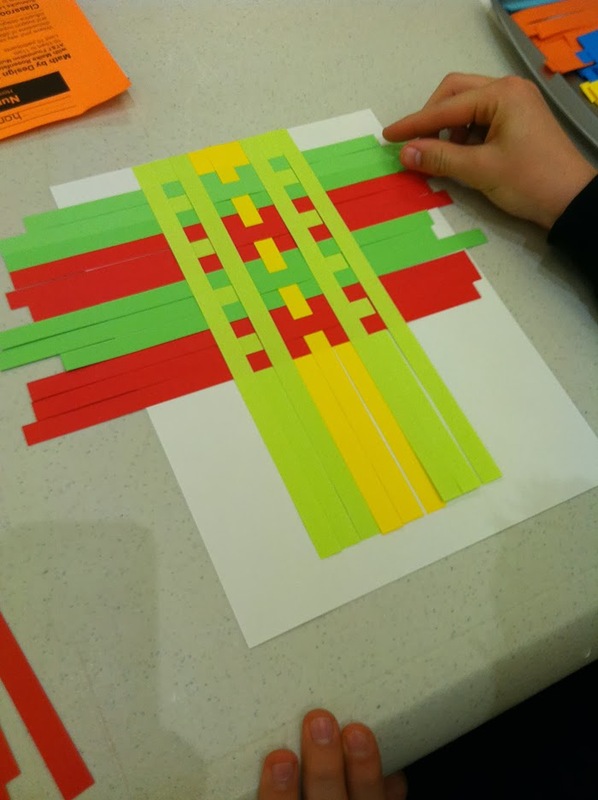 What’s the difference between using the body to illustrate mathematical ideas and using the body to create and express an understanding of mathematical ideas? 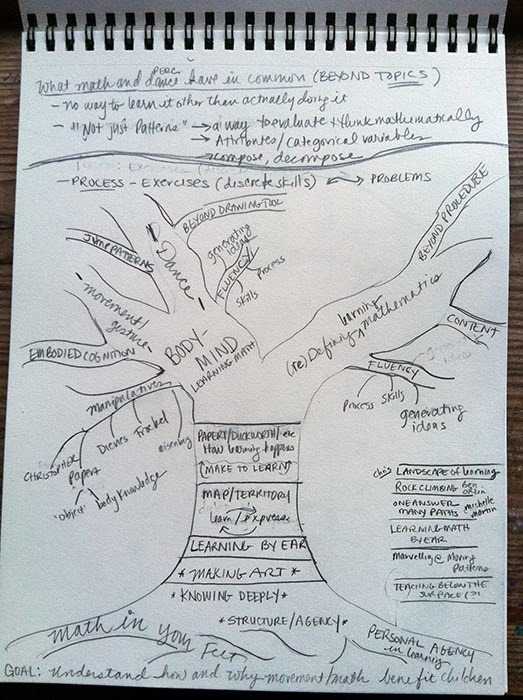 What’s the difference between using body knowledge (ala Papert and his gears) and creating body knowledge? What’s the difference between identifying properties of an object (say, a piece of art, or an insect) and actively choosing from an inventory of attributes to make your own? Each of these questions needs its own, more specific treatment. My observation today is simply that each pairing seems to create a similar tension in my mind. These are all active words, but the nature of the activity is qualitatively different depending on which side of the learning process you're on. Today the words fixed and flexible came up in relation to how we are approaching the activities in the variables book. 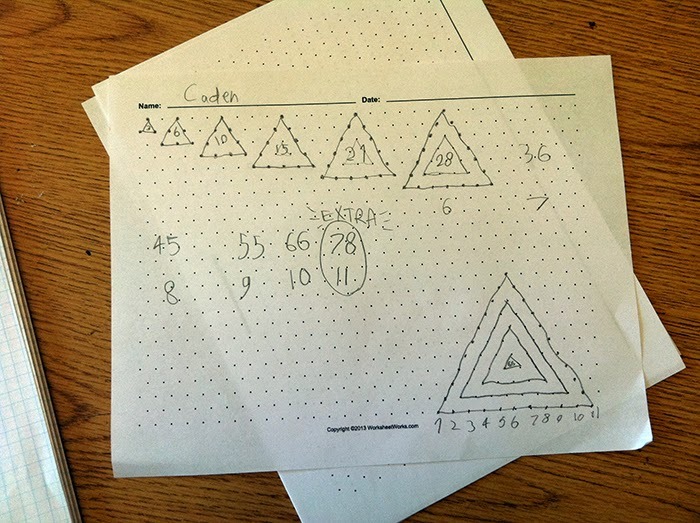 Puzzles and games that focus on identifying properties happen within a fixed structure. Using body knowledge to understand a set of gears assumes that you are using a certain set of body experiences, created at some point in the past. 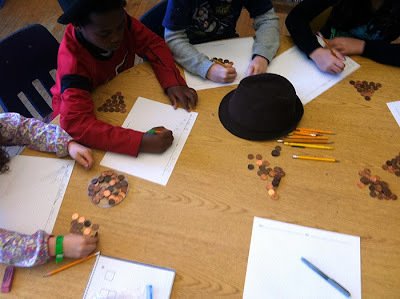 Illustrating math ideas using the body means there is a predetermined goal for the activity and that the outcome needs to look a specific way. Learning vocabulary and language in context and, in math, using multiple strategies to solve a problem are both process oriented and context dependent. In making, having a large inventory of ideas/things/skills from which to choose and create your own novel ideas (like a dance step) is an open-ended investigation. “Fixed” and “Flexible” are not judgments; they are inverses of each other. They go both ways. Just like you need to compose and decompose numbers to see the full relationships embedded in those two activities, so do you need to identify and use properties, build and use body knowledge, and illustrate and express mathematical ideas. 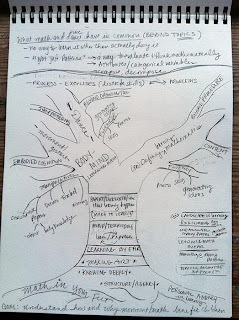 Fixed: The parts of learning (anything, really) that are perhaps learning objectives that are easier to identify in an assessment, but still crucial. Some call this skill building. 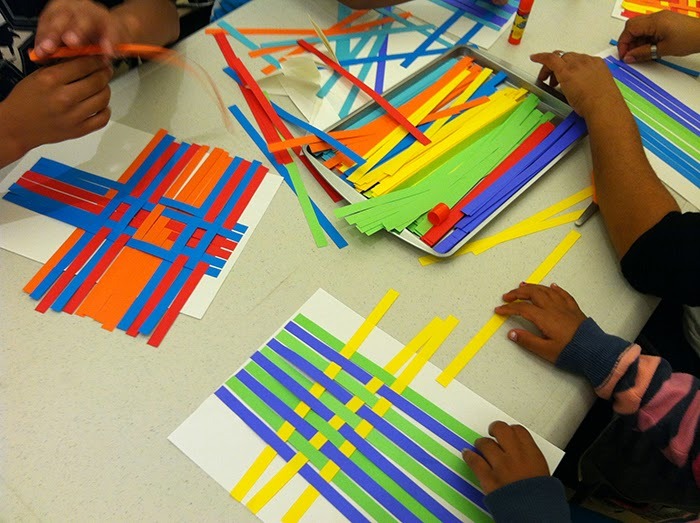 Flexible: Relates to the processes of learning which (as anyone who has tried arts integration, project based learning, or focusing on mathematical practices may have experienced) are much harder to nail down when tasked with assessing such activity. Some call this fluency. You can't have one without the other. Thoughts, feedback, pushback and conversation are always welcome. Does "Body Knowledge" Have an Inverse? I have some questions which may not be fully formed. 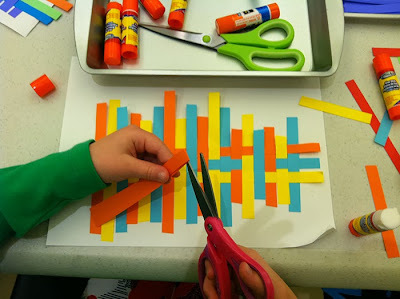 If you know of or have read the work of Seymour Papert, I could really use your thoughts here. My question is around this idea of 'body knowledge.' It seems Papert uses that phrase to mean that body experience in the world can, at a later time, be brought to bear on understanding mathematical ideas. His Logo geometry (which used a programmable object called a turtle) is said to be something you can “walk” through. From my perspective, programming a moving object is not actual walking or actual movement; it is, like Papert mentioned in his gears story, a projected walking—projecting body knowledge into the object itself. When thinking about the body's role in math learning, I wonder if Papert ever considered the inverse to such a process, specifically, how a body might participate in actively creating body knowledge of mathematics. The double relationship he mentions ("both abstract and sensory") seems to relate only to the sensory memory, not to the using the senses in the moment. Any thoughts will be incredibly helpful. If I'm barking up the wrong tree, tell me. If you want me to clarify anything, let me know. My third-grade daughter goes to a school where they have a whole hour for lunch. Not only that, although lunch time is monitored, children are free to move around both inside and outside of the school within boundaries determined by their grade level. From the reports my daughter gives me about this time of day it seems like lunch is not just for eating (as evidenced by half-eaten sandwiches in the lunch box at the end of the day). 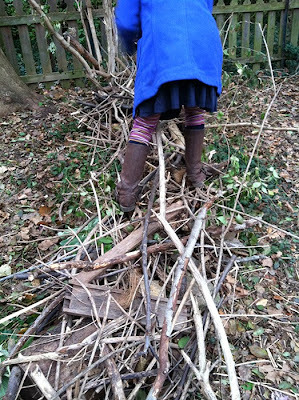 Lunch is for making up skits, finding interesting properties in the rocks you are pounding, for having arguments and making up, for exploring the narrow (but long) strip of trees that line one side of the school's property, called 'the woods', and for creating clubs. At a school with a no-exclusion rule, a club can be pretty much any combination of kids at any one time. A very well constructed, sturdy wall, a wall built with a lot of thought and insight. 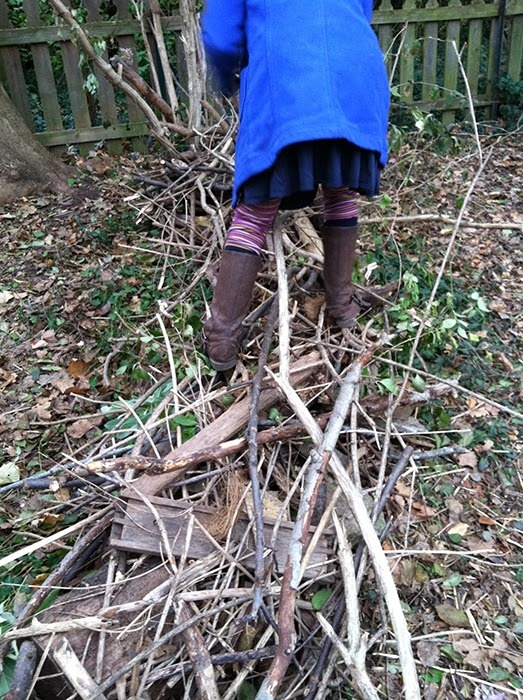 There is a base of bricks and concrete and then a layer of sticks. And, there is also a latch (the wire) which is lifted by the "door" (the stick), "Although we don't usually go in this way because it's not sturdy. We usually just go in over the low wall." The space to the left side of the photo is the, I guess, living space of the fort. "During our conversations it became evident that Ophelia was focused on making for herself a “special place”  rather than a special structure with four walls, a roof, and a door. 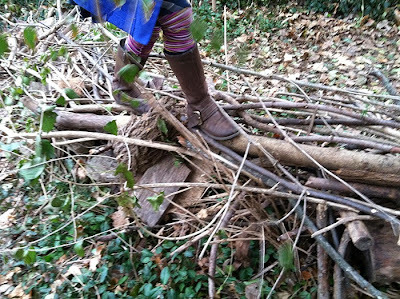 As David Sobel emphasized in his book Children’s Special Places: Exploring the Role of Forts, Dens, and Bush Houses in Middle Childhood: 'Through making special places, children are experiencing themselves as shapers and makers of small worlds. This experience contributes to making them active shapers of the world in their adult lives.'" 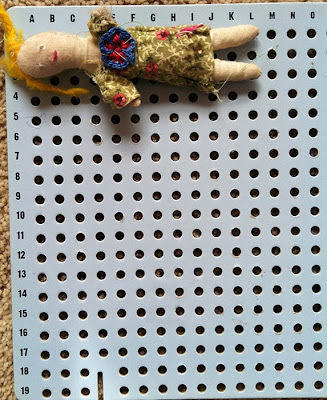 In sharing this story about my daughter's lunchtime adventures, I am aware that it is not about math learning, per se, but it does relate to a book I am writing about the body learning math. In past writings I have focused very closely in on the specifics of the Math in Your Feet program; this new book is a chance to step back and look at the broader issues involved in making math and dance at the same time. Source: Powell, K. The apprenticeship of embodied knowledge in a taiko drumming ensemble. In L. Bresler (Ed. ), Knowing bodies, moving minds: Embodied knowledge in education (pp. 183-195). Dordrecht, The Netherlands: Klewar Press. The body is not simply a vehicle toward realizing the perceived pinnacle of abstracted knowledge housed in the mind. The body is where learning originates. Living in a body is also the way children learn personal agency as they make decisions about how their bodies will move and act and how that power can influence and shape their world. 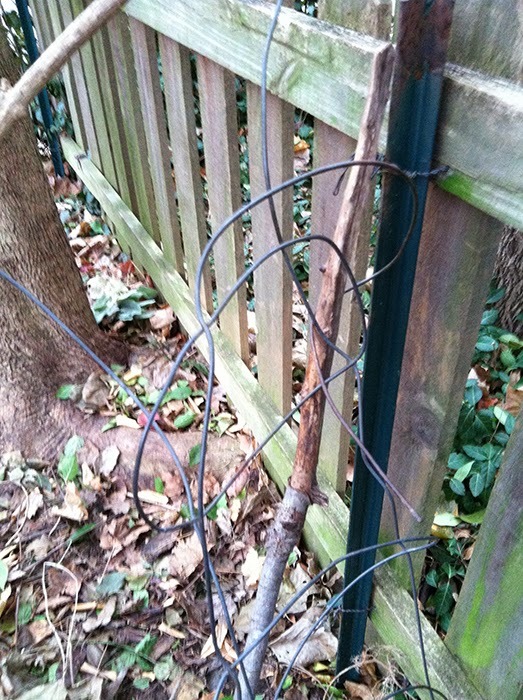 And, in the process, learning that there are obvious consequences and responses in relation to their actions. This is literally and viscerally democracy in action. Perhaps most importantly, despite the incredible change of pace and screen-focused activity in modern life, children still have brains that learn best by moving and pulling sensory input in through all parts of the body. Hundreds of years of thoughtful analysis, research, and observation of children learning and growing has shown this to be true and yet the body is still being marginalized in favor of knowledge as something gold and shiny to be won and placed on a high shelf for viewing, far removed from any experience and personal understanding. What is a body without agency? What is learning without a body? Thinking about these questions is the important first step in understanding the inherent worth of children using their bodies to make math and dance at the same time. Onward! How Are We the Same? At my daughter's school, middle of the morning, to pick her up for a dentist appointment. Ran into the restroom before I went to get her. Me: "Hey look! We left at the same time! ... And now we're washing our hands at the same time..."
Child: "And we're both using soap at the same time." Me: "And now we're both rinsing..."
Child: "Do you like to do things at the same time?" Me: "I don't know, do you?" Me: "... and now we're both drying our hands at the same time." Child (walking toward the closet door): "Oh, I thought that was the door..."
Me: "They do look the same, don't they? Hey, I know, let's go out the restroom door together at the same time!" And out we go, into the hall, and on with our respective days. At the same time. She is little, I am big. She is young and I am ... not young. She was at one sink, I the other. And yet, we did the same actions at the same moment. And in that moment we were the same. And we knew it. And that was fun! Bright, Brave, Open Minds: A Problem Solving Kaleidoscope | An Open Online Course for Parents and Teachers! Bright, brave, open minds: A problem solving kaleidoscope led by Julia Brodsky and Maria Droujkova is a two-week long open online course in problem solving for parents and teachers of 8 and 9 year old children. Why: Preserve children’s divergent thinking. Develop their critical thinking and problem solving skills. Contribute to making a book about young problem solving. 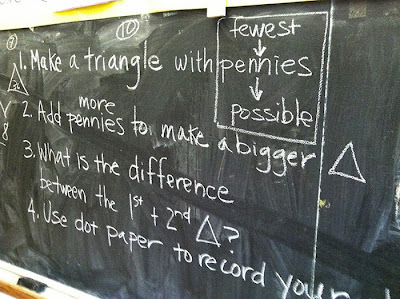 How: Provide a variety of insight problems to young children. Introduce complex, open-ended, and ill-defined problems as a way to teach problem solving skills. Recognize the feeling of being stuck as a necessary step in problem solving. Let children face deep, multi-dimensional problems. Meet other adventurous parents and educators. 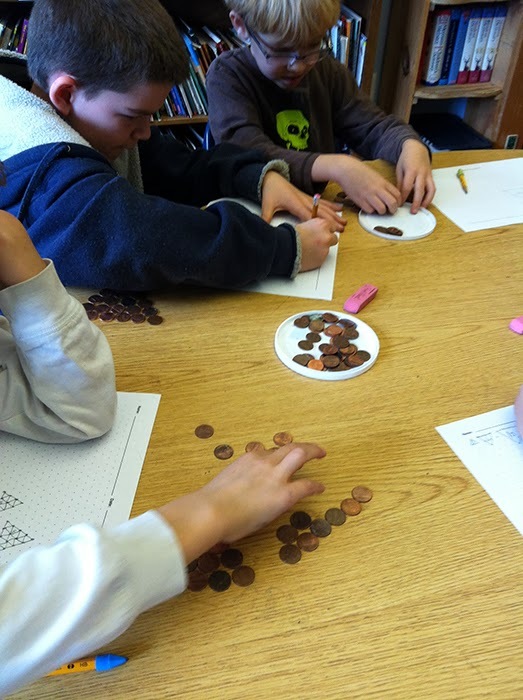 Contribute to research in math and problem-solving education. Who: The course organizers are Julia Brodsky, former NASA astronaut instructor and math and science teacher, and Dr. Maria Droujkova, math education consultant. The course participants are families, adventurous teachers, math clubs, playgroups, and other leaders of groups doing problem solving with young kids. What: In the first week of the course, we will discuss settings and practices for introducing problem solving to young children. 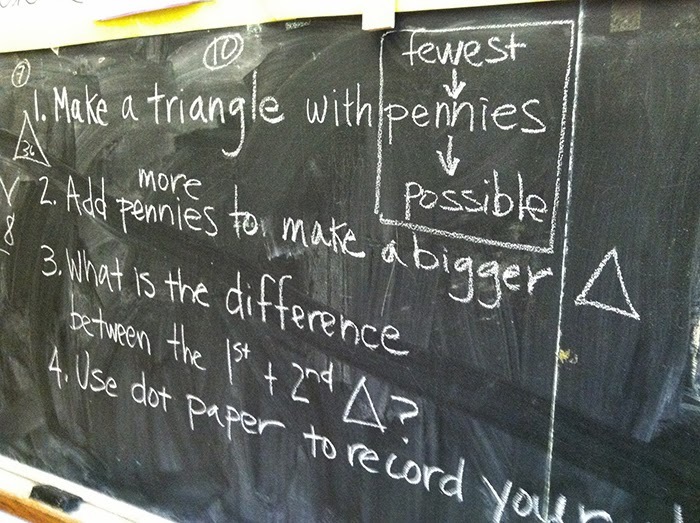 You will look at topics from Julia’s math circle, and discuss how to teach them. In the second week, you will gather your kids and their friends in a casual math circle, try out the topics, and then answer a few questions about your experience. When: Sign up via the Moebius Noodles website by December 2nd. The main course activities will happen December 2nd through 16th. Expect to spend several hours a week doing course tasks. Where: Main course activities will happen at our online ask and tell hub. The page you are on now will be updated with major links and news. Organizers will send you summary emails. We will have two live meetings online, at the beginning and at the end of the course, and post their recordings to this page. "You know what I noticed, Malke?" 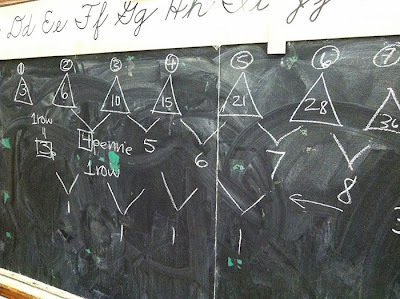 says one of the kids during this week's math groups in my daughter's 3rd/4th grade class, "Everything you've done with us is about triangles." You know what I've noticed? I've noticed that making math with the kids in my daughter's 3rd/4th grade classroom once a week is giving me empathy for learning how to teach something brand new. 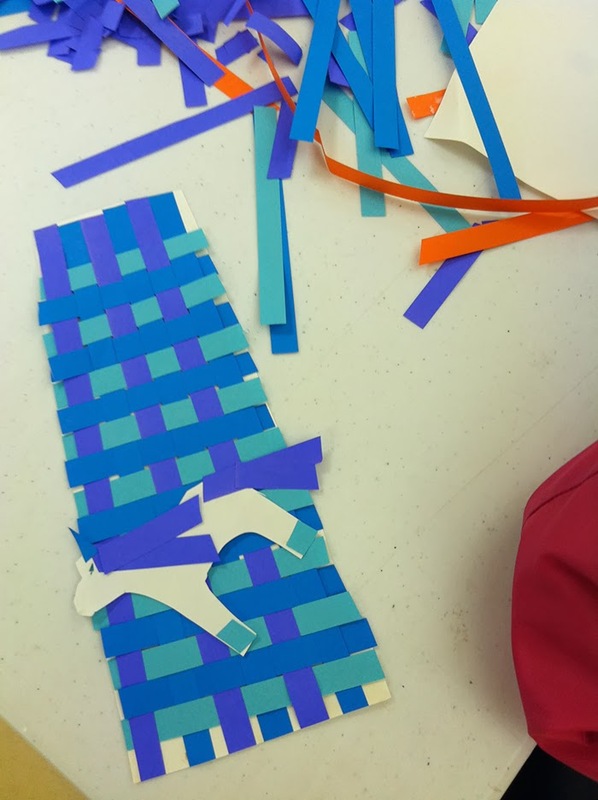 I'm thinking specifically of the teachers who attend my Math in Your Feet workshops to learn how the program works -- it's not lost on me how much newness there is to manage even in simply getting kids up to learn and think with their bodies, not to mention learning math in a completely new way. The newness for me is the fact that I am not teaching dance. 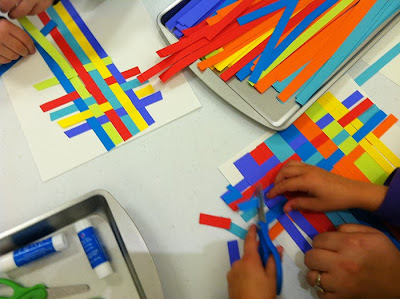 And, even though I am focusing mostly on having kids explore numbers and number patterns visually, which seems easy enough, the newness is in orchestrating the experience so that we are not just noticing visual patterns but that we also move those observations forward with analyzing the number patterns we see. It's a fun and engrossing challenge, but I'm glad I have four groups to work with because it gives me multiple opportunities to smooth out how I present and sequence the lesson. Today we investigated how triangles grow. We got out the pennies and started building. "You know what I see?" said one girl, "Each new triangle has the old one inside it." 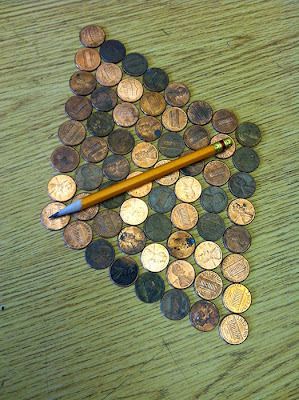 Then we started recording our observations on dot paper, one triangle at a time, including how many pennies it took to make each triangle. Every minute or two I'd check in with them and get the consensus about the number of pennies in each triangle. 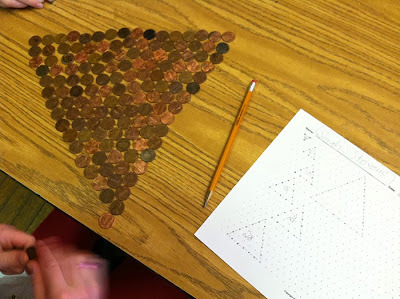 Once most kids got to the fifth triangle we put down our pencils and pennies and started looking for patterns. 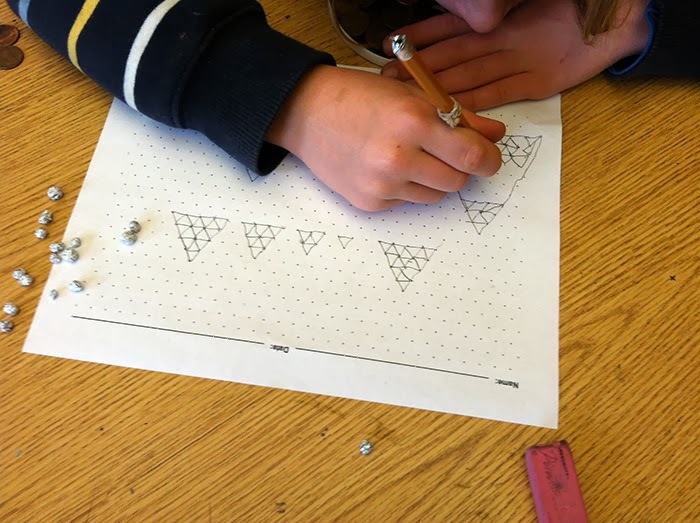 During construction/hands-on time, many kids noticed while they worked that each new triangle was built by adding on a new row, and that the new row was one more penny than the row before. The picture above shows quite clearly the pattern we found in the growth between each triangle and that it confirmed our observations about the growing rows. At this point I stopped all penny action and asked them to take "what you know about how they grow" and skip ahead to the 10th, 11th or 12th triangle using only the numbers to help them calculate the answer. Some kids did this easily. 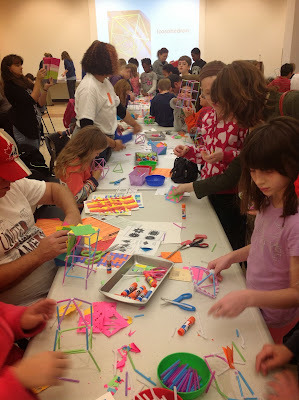 Whether it was easy or less easy, most kids found it an enjoyable challenge, which I was very happy to see. Other kids seemed less interested in solving the final challenge of skipping ahead and instead enjoyed finding patterns within the triangles they had recorded or by playing with the pennies themselves. I consider this all good grist for the mill and great thinking for many reasons. Math groups with Malke happen on Friday math game day. 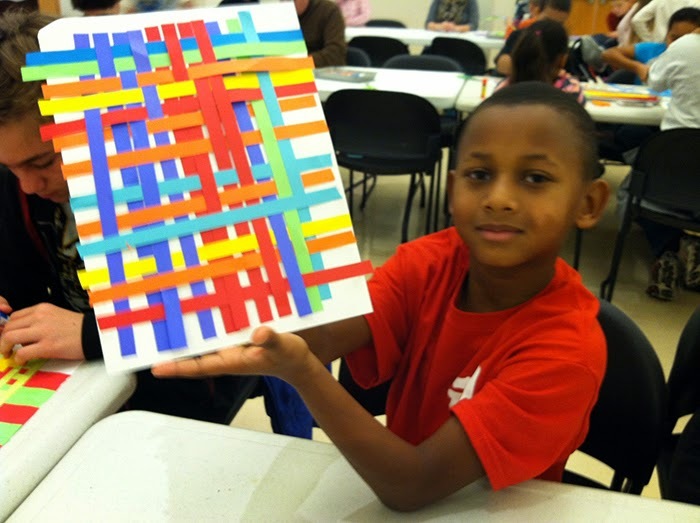 One of the teachers remarked that he thought kids might not want to leave their games to come to math group. The reality has been, though, that when their group is called, they all troop willingly into my little room, often a little curious. This, coupled with their intent concentration and thoughtful work, shows me that though I may be new to teaching sit-down math (!) I am orchestrating investigations that are engaging to these eight- and nine-year old learners and flexible enough to challenge a range of math abilities. Their skills grow, my skills grow. We all enjoy math. Win-win-WIN. "Mama, is a curve a line?" "Oh, come on, you asked the question, I bet you have some thoughts about it." 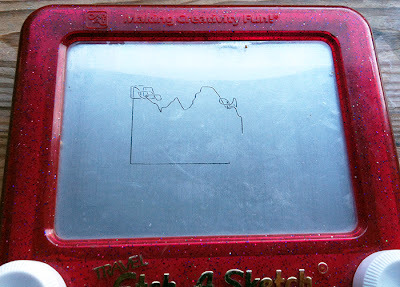 Showing me her Etch-a-Sketch and turning the knobs: "Okay, this is a line [drawing a straight line horizontally to the left] and this is a line [drawing a line vertically upward] but this is not a line [squiggling the line back and forth]." "Why isn't that back and forth drawing a line?" "Because it has to go in one direction. This curve is a line, but not when it goes back and forth..."
I left it there because the kid was sick, it was time to start resting and I know answers often rely on more questions about and interactions with the idea at hand. I'm sure this'll come up again at some point in the future. will understand, the original got destroyed with an inadvertent shake. I've just started a book project. What's it about? Well, for now, I think it's about digging into the whys and hows of learning math and dance at the same time. This may change, but that's where I'm at right now. To organize and clarify my thoughts I've been doing quite a bit of background reading, having e-mail/online conversations with various wonderful people, and drafting some preliminary chapters in the blissfully serene Silent Reading Room at our local public library. Tons of natural light, total silence except for the hum of the HVAC and the occasional cough. One day last week I sat down to read and felt that old feeling coming on that I used to get in college. It signifies I am completely saturated and overwhelmed with thinking, reading and writing. It makes me a bit crazy, honestly. To combat it, I've learned to skim text and only read closely when I need specific information. Even better, go for a long, long walk with far away vistas. I call that part of my brain my 'word-mind' and it is very clearly located in my head. Using my word-mind is a completely different experience from thinking with my body-mind. I know, because after college I started dancing and was introduced to another part of the thinking equation -- the body thinks too, a phenomenon that is defined and described by studies in embodied cognition (a branch of cognitive science). The body thinks, too. This was truly a revelation to me. Ultimately, there were years (and years) where I was required to use only my word-mind to learn. And then there were bunches of years (as an adult) where I learned and expressed myself solely through my body mind (dance and music performance, never wanted to get on the mic to talk). My body-mind thinks differently than my word-mind, but what I have come to realize is that, in addition to needing to find a balance between the two in my daily life, as a learner I learn best when I am using both at the same time. 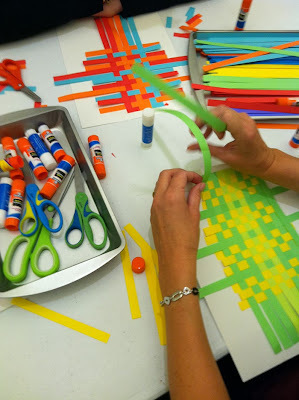 I was in Minnesota this summer, sharing my work with a group of teachers and teaching artists. That's when I met Christopher Danielson in person. Yes, an educator of math educators came to my workshop. I was a wee bit nervous but I needn't have worried. Even though in my workshops we make dance and math for a large proportion of the time, Christopher was game to dance and dance he did. He also took copious notes by hand at various intervals. I was again a wee bit worried, but it turned out our 90 minutes of dance and math making had gotten him thinking. In a good way. 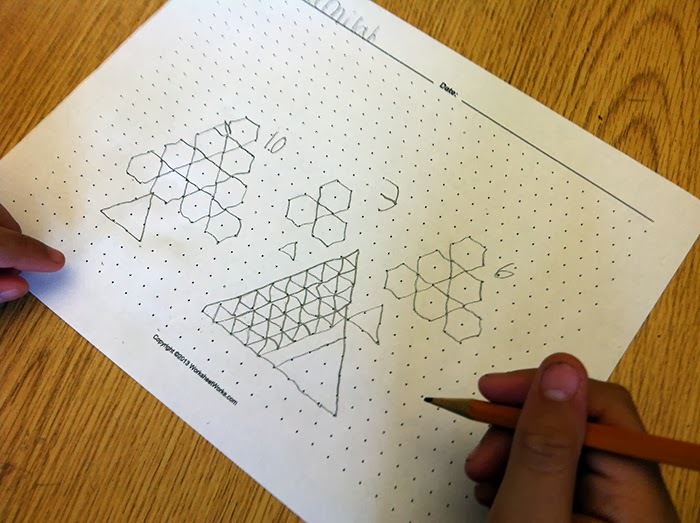 By engaging with the work of Math in Your Feet from the inside of the experience instead of simply watching, he generated many new questions that moved his thinking forward in new ways. The next day we met for a breakfast conversation during which, in relation to one of the questions he had while dancing, Christopher mentioned a now defunct unit in the Connected Mathematics series that investigates transforming squares in a series of combinations and is related to the thinking in modern algebra. Later, he sent me the book. I meant to get started on it but life took over. And then my book took over. This week my word-mind gave out. I was literally a little dizzy from thinking in my head and was completely DONE with words. I do a lot with language these days. I keep a blog, I'm active on Facebook and Twitter, and I edit a year-round, international online writing project for the Teaching Artist Journal. So to have reached my limit with words is saying something. I needed something completely different to do. I pulled the Connected Mathematics book off my desk, sharpened my pencil and headed for the library. I made my little square out of nice stiff paper. I labeled the vertices. I combined series of turns and flips, filled in the table and investigated the patterns I saw. For a good portion of the time I was completely frustrated and confused -- turns out I was turning clockwise when I should have been turning counter. Apparently there is some convention among mathematicians that all rotations go counterclockwise. They must have all been left handed and never learned analog (clockwise) time because this right dominated person kept seeing the "R" for rotate as meaning "turn RIGHT." At some point, though, I was looking at my hands, turning, flipping, holding corners to orient them as I turned and flipped, and I realized I was in some kind of zone. I was talking to myself in words: specific conscious reminders to turn left when rotating, murmuring less conscious words while filling in the chart, a gentle narration as I talked myself through each new sequence of flips and turns and, eventually, the body and words merged and I was just doing. I had fallen into a zone of concentration while making math that mirrored what often happens when I am learning something new in dance. After making numerous combinations of transformations with my hands, I now have a new feel for what a square is and is capable of. Both the word-mind and the body-mind had a part to play in this new understanding. I hope it is obvious that this is not an either/or kind of story -- it's about both. Understanding cognition and thinking and knowing is a vast endeavor and I don't know if we will ever fully understand the complexity of it all. My focus is on what it means and looks like to learn math with the body as an equal partner and to do this I need to keep the body's way of knowing and thinking firmly in my sights. We can see the body moving, but most of us have not yet learned how to look at and understand the knowing and learning happening while the body moves. It's an inside process and not one that a child will necessarily be able to tell you about. As more experienced learners the onus is on the adults to look for how children show us what they know and think with all their one hundred languages, including the body. Once we acknowledge the body as the seat of knowledge itself rather than as a stepping stone to abstractions, it is possible to organize teaching differently. In doing so, [this] brings forth the possibility of inquiring into such questions as, 'What might we do to recognize and understand children's knowledge expressed in modes other than speech or writing?'" One thing you can do is to try learning math and dance at the same time yourself. I'm available to talk about how I can help, if you like. Feel free to get in touch. Recently, my eight year old spontaneously discovered an activity I've seen in the Moebius Noodles book and yet another version of infinity (read about others here, here, and here). Waiting for the bread to toast. 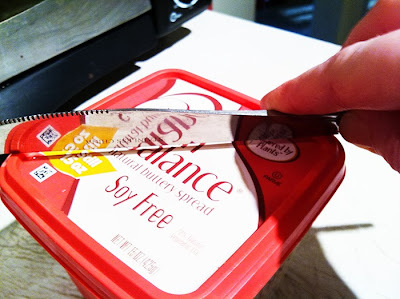 She picks up the butter knife off the counter and places it vertically over a design on the lid to the butter container. "It turns into an arrow! What a cool design." She continues to play around with "cutting" the lid's design in half, one side the real the other the reflection. "It has something to do with infinity," she says, as the triangles get smaller and smaller and smaller. "I need something different [than the scissors she's using] -- a tiny knife like scientists have -- to cut infinity stuff like this." I've been reading books by former colleagues and students of Jean Piaget who have carried his work forward and made it accessible to the rest of us. My take away so far, beyond the idea that all of us construct our knowledge by assimilating new information into what we already know or think we know, is that children think when they have something real, some phenomenon, to think about. Whether it's a butter knife or an infinity knife or whatever else, it's the interaction between the child and the object/idea that inspires the child to think -- what Eleanor Duckworth calls "the having of wonderful ideas." Whatever else we do as teachers and parents, I think we need to find multiple ways to allow kids the freedom to discover the world on their own terms, in their own ways. At the same time we need to create the time and space in our teacher/parent brains to catch our children and students in the middle of discovering something brand new (to them). 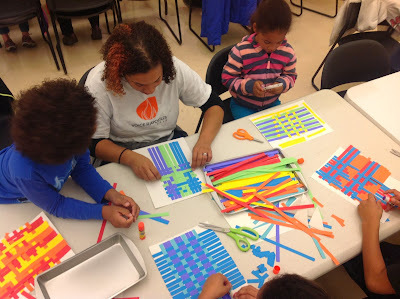 Having wonderful ideas, as Duckworth says, is "the essence of intellectual development." Honestly, being able to observe and even, sometimes, to interact with my kid when she's in the middle of a new thought is pretty much the prize of parenthood -- it is such a gift to see this happen up close. Turns out, Christopher (@trianglemancsd) dressed up like me!! This is the picture that I use on Twitter (notice the precision tape job ;-). Fun stuff! I laid down some tape on the kitchen floor for the photo last night, then proceeded to do the dishes. Tabitha [who is six] wandered in and proclaimed "There's tape on the floor!" She then spent the next 20 minutes making up games using the tape lines. There was one where you needed to jump from one tape line to the next, always landing on one foot, with an extra challenge of landing as close as possible to the end of the line. There was another where you stand in one square, put your hands in the other then jump your feet over to the one where your hands are, with extra credit for doing it with style. She was eager for me to finish the dishes so that she could teach me the games, which she did and we spent another lovely 15 minutes on that before I had to cut off for the photo and then bedtime. It was a beautiful little family moment. See?! This is what I have been saying for years! Put down some tape, even just one straight line, then wait and watch. Changing the environment, even slightly, will invoke an explore response in kids and, inevitably they will find some way to figure out this 'new' space with their bodies. (And, it's a body thing, but for kids it's also a body knowledge math thing.) Fantastic. Also, I have a square on the floor of my office (more carefully taped, I'll have you know) that I laid down when I was practicing for my #miyfeet lesson. People notice it and comment on it when they come in. But NO ONE plays with it. Common questions from my colleagues include whether it is where they need to stand while they talk to me, or where I put students who don't do homework. Students tend not to comment on it. Tabitha hasn't been in my office since I laid it down, but I predict great fun will be had when arrives someday. 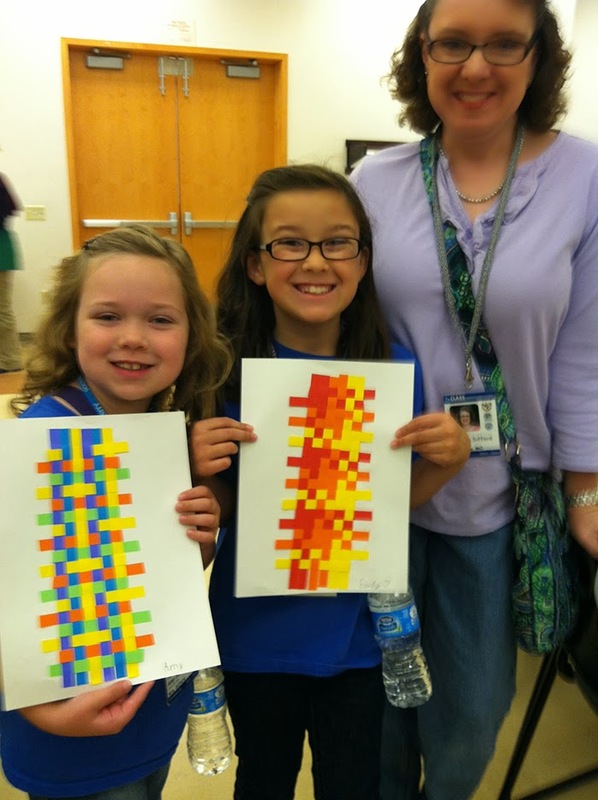 "In my view, there are two aspects to teaching. The first is to put students into contact with phenomena [of which tape on the floor is a good example] related to the area to be studied -- the real thing, not books or lectures about it -- and to help them notice what is interesting; to engage them so they will continue to think and wonder about it. 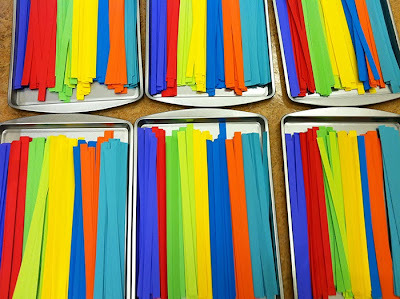 The second is to have the students try to explain the sense they are making and, instead of explaining things to students, to try to understand their sense." Children can 'explain' their sense making through their bodies if you have the right glasses on. 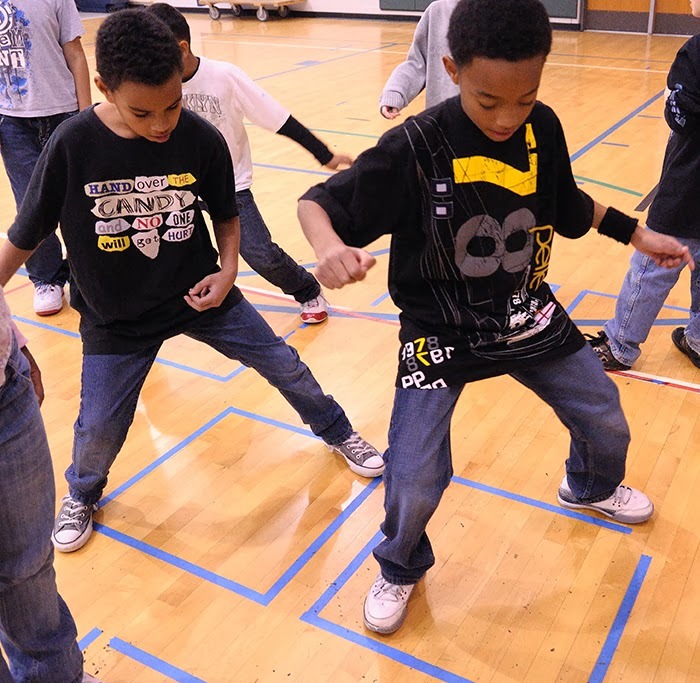 Just before my dance workshop in St. Louis last week I noticed kids out in the lobby playing (jumping around) on an inset in the tile floor - darker tiles that made up an array and a specific space within the larger floor area. These were not just kids getting out some energy (although that was part of the story) but kids having their own new, wonderful ideas about how to explore the new and interesting floor patterns. Kids will play in new ways (to them) and in new physical environments with their bodies first. That's the truth. 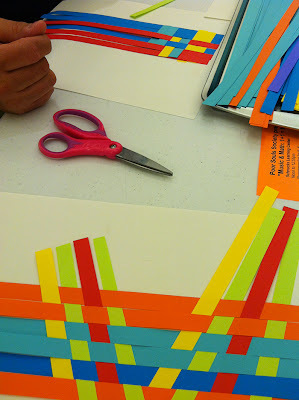 ...plus a quick powerpoint introduction of how to use these paper strips to make beautiful things. Create your warp with number multiples (3,3,3) or (2, 2, 2) or (5,5) or whatever you want and decide on a color pattern. Create your weave pattern rule (number of overs and unders) and then see how it affects your design when you invert that rule or change the weave color. Make a rule. Ask questions about it. ...but think visually as well. Experiment with warp numbers and colors. A marvelous Monday making math! No. It's a bike rack that, with the sun's help, created a shadow of the symbol for phi. 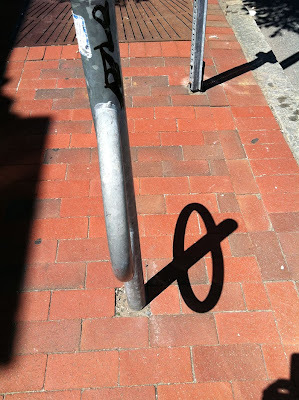 Is the symbol itself math? "Have I reached Malke’s beautiful standard of embodied math? Nah. But it’s in my head as a goal, whenever I can make sense of it. "Malke, here’s one body thing I do that probably doesn't count. The graph of y=x^2 is a parabola. I like to think of it as having both arms up. I like to think of the graph of y=x^3 as having one arm (left) down and the other (right) up. We are working with graphing more complicated polynomial functions, and I ask them to show me (what I call) the big picture with their arms. I’m hoping to get them to hold this visual information more firmly in place while they work through the detailed parts, so that their graph will reflect their thinking on both the big picture and the details. I’m using body movement just as a cuing device, really." "Sue, I think making sense of what math is in the body is a lengthy ongoing proposition for most of us, even the dancers. My goal is to at least raise some questions: Is the graph the math? Are the arms doing the graph the math? My answers: The graph is the representation of the idea and the arms are the representation of the graph. That is why my blog is called 'the map is not the territory'. Those teachers Christopher mentioned are part of the legions of people who, by no fault of their own, mistake the textbook (map) for the math (actual experience of thinking and doing math) because they've never had a chance to travel the actual terrain of math land. 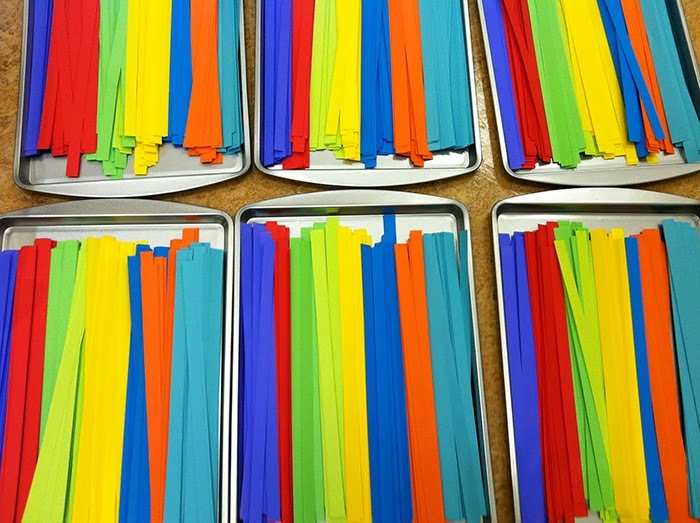 Personally I think there's no problem with a 'cuing device' or mnemonic as long as you are aware of where it lies in the continuum of math learning and your teaching goals." I repeat: "...the philosopher is like a prisoner who is freed from the cave and comes to understand that the shadows on the wall do not make up reality at all..."
"Math comes from, and lives within, textbooks. I am not OK with this. "So what can we do in every lesson every day to represent mathematics as a subject that comes from, and lives within, the minds (and bodies) of our students?" 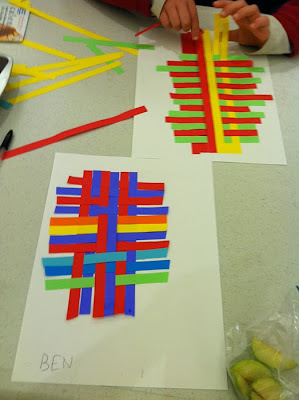 These are the things I am thinking as I try to make a worthwhile case toward using the body in math learning for something other than re-drawing the 2D representations in our textbooks. This post is an addendum to my last post on meaningful non-dance movement in math learning. After some reflection, I realized that for any of my thoughts to make any sense, I need give some concrete examples of what I personally see as a math learning through the body outside of a dance context. I homeschooled my daughter for first and second grades but I did not explicitly employ any kind of kinesthetic approach to learning math or anything else, for that matter. She wouldn't accept anything formal for the first year so we spent a lot of time out of the house -- on walks (with lots of opportunities to talk math), math games, thrifting (always lots of history lessons there), reading books, listening to audio books, library visits, making stuff. For a while I wasn't completely confident in my approach, but over time I realized she was showing me what she was learning in many different ways: through conversation, through her art work and other creations, and, very often, through her physical movement. Here are some summaries of and links to blog posts from the past couple years that documented this phenomenon of "the mind needing a body to think with". 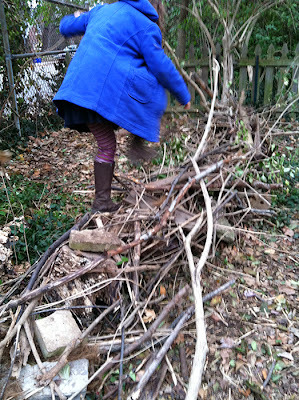 At the very least this will give you a peek into what I see when as I watch a child physically interact with her world. I'll start with a potent example in full, and give excerpts for the rest. My daughter was six and seven in these examples. It's been a loooong time since the kid has ridden her bike. So long it seemed like the first time again today. She felt wobbly. Steering was a challenge. So, she gave herself a pep talk as she worked to reacquaint herself with the activity. "Okay, all I have to do is think like a straight line in geometry..."
She rode back and forth across the basketball courts chanting her new her mantra. "Think like a straight line, think like a straight line, think like a straight line in geometry." When she'd get to the end of the court, she'd get off the bike and turn it around. Then she figured she could make the turn without getting off. "All I have to do when I get to the end is think like a circle...."
I'm sure she'll be back in the swing of things in no time. Plus, I love the thought that pathways have specific intentions. She's in the math, man. Totally in it. My conversations with Christopher Danielson over the last couple months about dance, math, Papert and learning have inspired me no end. He's a great provoker, and I say that with the utmost respect, especially in the area of question asking. 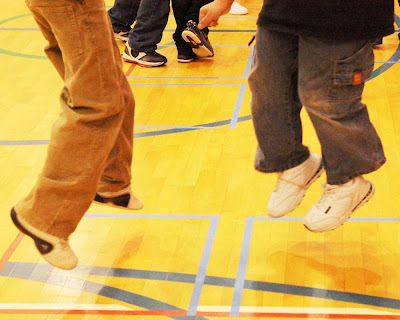 "Do you have examples of meaningful movement in mathematics teaching that are not dance?" The answer may take many lifetimes of work, but we can still benefit from partial answers and that is what I provide here. To start, meaningful movement in mathematics learning can be either dance or non-dance. Dance implies a meaningful system in itself -- in my work, for example, percussive dance steps can be created using a variety of movement variables authentic to the art form coupled with a musical aesthetic. Examples of non-dance movement in mathematics learning has been a little harder for me to nail down. This is what I have so far, please feel free to add to this list. 1. 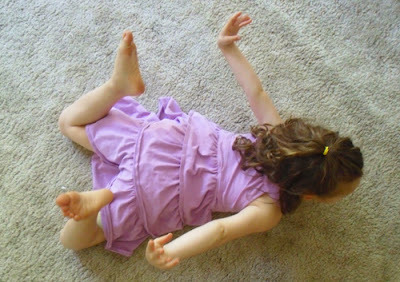 Meaningful non-dance movement in math learning happens in the natural body system of gesture and everyday movements (as shown in the work of Susan Gerofsky and this study that showed that 'children think and learn [math] through their bodies. Also, here's a past blog post of mine with links to more research and thinking on this topic). This body system of gesturing as both a way of expressing knowledge and a way to think through ideas (mathematical ones, specifically) is at work whether we have noticed it or not. As with anything related to body knowledge, we need to grow our movement/math learning eyes so we know what to look for in our learners. A recent post on Christopher's Talking Math with Your Kids blog shares a story of a child using her own body knowledge to essentially discover one-to-one correspondence. This is not necessarily gesture, but it is a potent example of something we could notice in this realm. The idea of gestures as non-verbal expression and thinking makes sense to me. On the whole, we tend to consider real knowing/learning as verbal and symbolic output. All I can say is that this hyper-focus on educating ourselves "from the neck up" coupled with the disappearance of hands-on learning-by-making in school (shop class, art, music, etc.) has alienated generations of children and convinced them to think they are really not all that smart when in fact that is not the truth at all. I was one of them. 2. Meaningful non-dance movement happens in a system where the child is using previous experiences in her body, or creating new understanding through her body, during exploration of mathematical ideas and concepts in school or with adults...and has agency over the exploration. This is agency -- the freedom to lead your own exploration and make mistakes on the path to new understanding. When a child is thinking about the choices she wants to make with the Turtle, it is her own body knowledge she relies on. That's agency. What is not agency is setting up that turtle and giving a class the exact same step-by-step directions on how to make it draw a flower, or a house, or whatever. 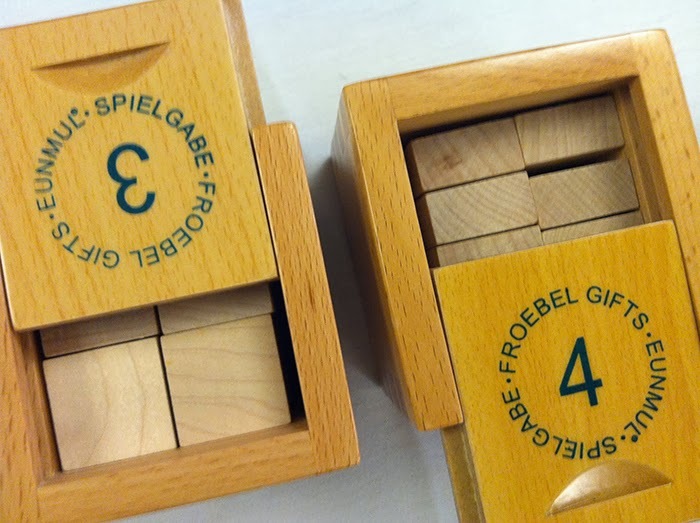 In the Froebel system there are three main ways to experience the gifts: using a narrative context in which to explore the properties and powers of the materials, explore the mathematical properties of the materials, and as a 'form of beauty' including exploration of symmetry and patterning. Sometimes the gifts are presented in a guided way, but it seems that there is plenty of opportunity in the Froebel system to explore these materials freely, with personal agency. "The mind needs a body to work in." As I write this I am finding all sorts new questions in these ideas I've set out and it's clear that this topic requires much more than a single blog post. 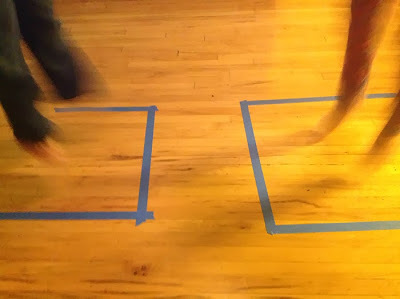 I've written more in depth about the differences between dance/math exercises (low to no agency), lessons (potential for limited agency) and truly exploring and making mathematical meaning through dance making (high agency) in the Math in Your Feet program. You can read and download the newly published article here. Let's keep this going: Am I missing anything? Any holes in my argument? What other examples of meaningful non-dance movement learning can you think of?